Foss is a site on the lower Nehalem river about 4 miles east of Mohler in Tillamook County. It was named after a local landowner and had a postoffice from 1928 to 1943. It was the site of a Civilian Conservation Corp (CCC) camp for a time. To this day Foss is the site of the river flood gauge used to measure the flow of the Nehalem River. A careful view of the photos here show how this area, heavily overgrown today, was impacted by the Tillamook Burn. 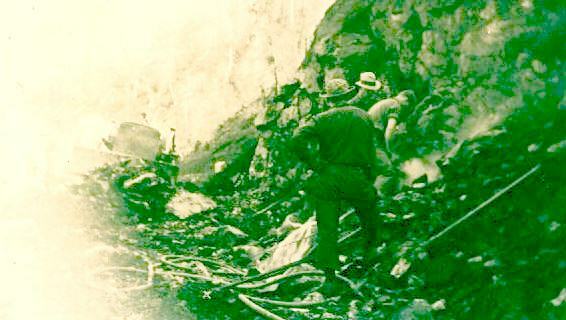 Foss was not always accessible by road. 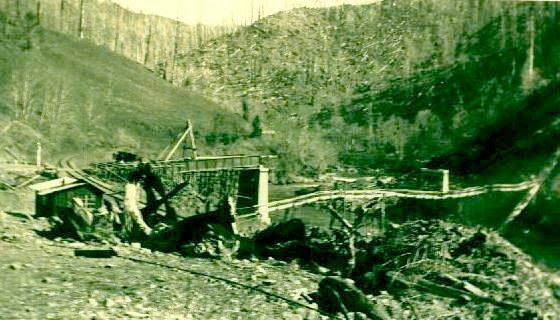 It was accessible by rail from the time the Tillamook rail line was constructed, but these other two photos show a cable suspension bridge across the Nehalem, reportedly the longest construction by the CCC. Note the Burned background and the railroad tracks passing under the end of the bridge. This foot bridge was construction about half a mile upriver from the camp at Foss.. 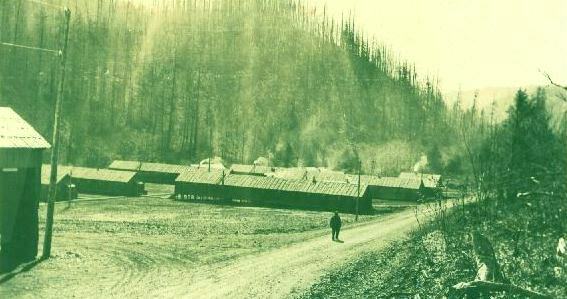 This final photo reflects construction efforts of a roadway between the footbridge and the camp at Foss. You can see that the going was difficult. You can see the rock drilling process going on in preparation for blasting the rock and a dozer in the background to handle the mucking. A special thanks goes to Bob Sharp who made his photos available for this display. Bob worked in this area and lived in Spruce Run for a period of time during the war, and contributed a number of the photos on this site. Foss is of significance now because it is the principal place in the lower Nehalem River where a river flow gauge is maintained. There are many years of water flow records available for the Nehalem at this site.